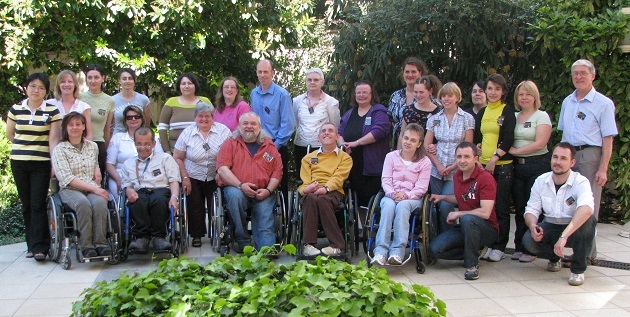 Participants of an European Disability Network meeting in Budapest. Are churches in Europe including people with disabilities? Are Christians aware of the real needs and opportunities in this area of work? 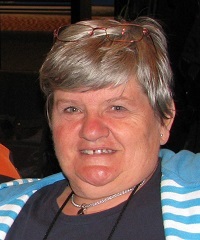 Thérèse Swinters is the facilitator of the European Disability Network (EDN), a platform that unites organisations and initiatives from several countries. After years of talking with church leaders, she comes to the conclusion that there is still much to do to help “getting the issue of disability onto the agenda”. ARE CHURCHES THINKING ABOUT PEOPLE WITH DISABILITIES? In the European Union, 70 million people aged 15 and over reported a disability in 2012, 18% of the total population. Almost 6 in 10 people with some kind of disability are women. 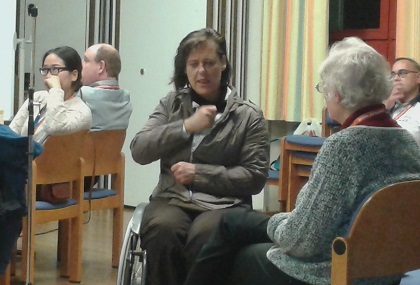 “In the more than 12 years that I have been the facilitator of the European Disability Network, my biggest problem has been to get the issue of disability spoken about - just getting it onto the agenda at all”, Swinters told Evangelical Focus. “This is especially the case in churches where people often think ‘we are all accepted by the Lord’ and conclude that there in no need to take any special action about disabled people”. This inclusion is not an issue of “getting people in a wheelchair into the church”. There are other more difficult areas “such as including learning disabled and deaf people in our study programs”. “As Tony Phelps Jones of Prospects UK puts it, ‘the good news is that when a church works hard at being a better place for disabled people, it becomes a better place for everybody’”. Participants of a EDN meeting in Budapest. Real friendships with people who live with a disability turn into a chance to learn about “how to face suffering”, Swinters explains. But not only leaders need to grow in vision, but everyone else. There are good intentions, and “Christians are normally loving and caring, but very often they don’t know when and how to help”. Initiatives need to come into place through relationships. “Every Christian should train themselves in taking contact with people with a disability”. One cannot help if he/she doesn’t know what is actually needed. “A person living with a disability always says: ‘Nothing about me, without me’”. 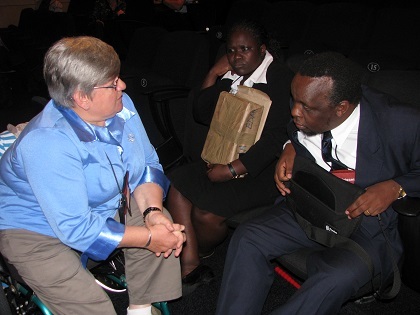 At the Lausanne Movement Cape Town 2010 congress, with representatives of the African Mission to Blind people. She underlines this: it is very important to “listen very careful to every detail of the answer”. Swinters shares an example of her own life. She uses a wheelchair, even in unfamiliar areas and longer distances (more than 50 meters). “I can put my wheelchair in and out my own car. But sometimes people want to help, but they do not ask me first, and that creates a difficulty for me. When people put the wheelchair in the car without my indications, I cannot take my wheelchair out on my own at home. And there is nobody to help”. “So, very often I tell people I will put my wheelchair in the car on my own, but then they have the impression that I don’t like them to tell me that I need help. Or they feel embarrassed because they think they should not have asked”. Such situations could be solved much more easily if people just took the time to ask and to listen well. What about the help offered by the governments? Swinters makes a distinction between Eastern Europe and Western Europe. Sign language translation during a EDN conference. In many countries, “more and more finances are released for daily companionship and help in everyday activities (somebody who is available to make meals, help with bathroom visit, shopping, outing) and overall assisting in the opportunity to live on their own for physical disabled as well as for people with learning disabilities, mental impairments and stabilised mentally ill people”. In contrast, “those payments are not or almost not available” in Eastern European countries. Swinters believes this could be related to the “attitude towards disability” and Human Rights in general, and to the impact faith has had in these countries in the past. Read the second part of this interview with Thérèse Swinters.